Flashpoint Autostand – A new Way to move! You usually don’t see me on the scene in my studio doing portrait work with light stands and soft boxes. You usually see me editing photos in Photoshop and that’s about it. However, I spend quite a bit of time in front of the lights. I have an unusual amount of lighting equipment for a “landscape guy”. It ranges anywhere from speedlights to LED lights to big soft boxes with continuous running studio CFL bulbs. With all of this lighting equipment I need quite a few stands. I have a plethora of options in the studio now. I have purchased far more than I need because it is so hard to find one that fits every box, especially on a budget. I keep many things in mind when I purchase stands. I recently picked up the Flashpoint Autostand by Adorama and I am thoroughly impressed by what I have seen so far. So what sets it a part from the rest you are wondering? 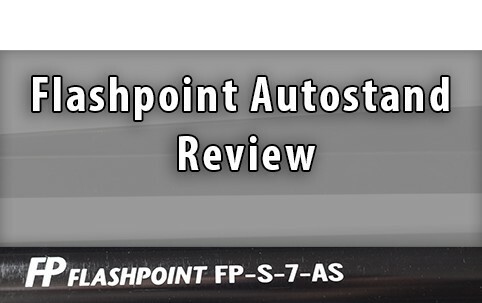 Well, to state the obvious (by the name) the Flashpoint Autostand has an automatic foot that opens when placed on the ground. While this may seem like a trivial asset, it is a treat in so many ways. I take a great deal of time setting up my work space. I get the lights just right, I put velcro straps on the excess cords, I ensure the area is 100% safe for myself or anyone who would be entering the space, but what happens when a stand needs to be moved? You have those dreaded stand legs swinging around. Not with the Flashpoint Autostand! Before we get into the Pros and Cons, let’s take a look at this quick demonstration video. First and foremost, the Flashpoint Autostand makes your studio a safer place. I cannot tell you how many times I have whacked myself in various places with the legs of my other stands when trying to open them or move them. This is a critical thing to consider when photographing children and babies. The legs are at their level and present quite a hazard when you need to move them around. The Flashpoint Autostand makes moving your lights around much safer. One handed operation. It doesn’t get much better than this! It is rather lightweight for easy portability. The knobs on the stand are longer and require less overall force to open. It comes with a clip on the shaft of the stand to hold your cord in place. Another added safety feature I enjoy. Reversible adapter for 1/4″ to 3/8″ lighting accessories with the option to fit at 90 degrees rather than vertically. I have quite a few stands to replace now. I wouldn’t put anything too heavy on the 7′ stand without the added safety of a sandbag at the base. While it is great for speedlights and LED Panels, I can see the base being fairly small for bigger lights and/or softboxes. The Flashpoint Autostand is an incredible innovation in studio lighting. I was shocked by how well it operated right out of the box. It sets up quickly and can make disastrous studio lighting environments a bit safer, especially for child and baby sessions, not to mention the shins of the photographer! The bottom line. $60 is a small fee to pay for the ease of operation, convenience of one handed operation, and the added safety of the studio environment. Thus no tripping on cords by photographers or clients.